Some of the great details that provide character and identity to Paradise Palms are the terrific mid-century modern doors found throughout the neighborhood. All of the builders offered something unique to each home and tract. Details included escutcheons, sidelights with textured or colored glass, trim, raised mullions, raised and/or carved panels in single and double door combinations. Many of the Palmer & Krisel-designed homes featured simple, flat panel doors with a Schlage ‘Ming’ escutcheon which allowed for the architecture of the home to be the star. Other tracts including Tropical Estates and Fontainebleau Estates featured gracious double-doored entries into their homes with raised-embellishments and Asian-themed ‘Shu’ Schlage escutcheons and grand wrought iron light fixtures. The Americana homes offered more traditional doors with textured, colored or clear sidelights while the semi-custom homes of Stellar Greens offered a variety of doors ranging from flat-panels to ornate, carved doors with raised panels. The custom-built homes of Paradise Palms offer everything from traditional door styles to full-atomic mid-century detailing including starbursts and center knob pulls. After fifty years in the desert sun coupled with changing tastes, wear and tear, mishaps and other maladies not all of the original entry doors have survived, and many times homeowners are left searching for replacement options. Local big-box retailers carry a wide variety of Colonial, Victorian, Craftsman, English-country and Tuscan styled doors which can sometimes be a tricky-fit for the desert modern and contemporary ranch homes of Paradise Palms. One of the most popular sources for replacement options is Crestview Doors which offer a wide variety of ranch, contemporary and modern styles. A recent source that offers an alternative to Crestview is the ‘Pulse’ line from Therma-Tru Doors which offer solid fiberglass construction. Flat-panel solid wood doors can still be obtained from most home-improvement retailers, yet interestingly these seemingly common doors are not always on the rack and may require additional time to order. This great! 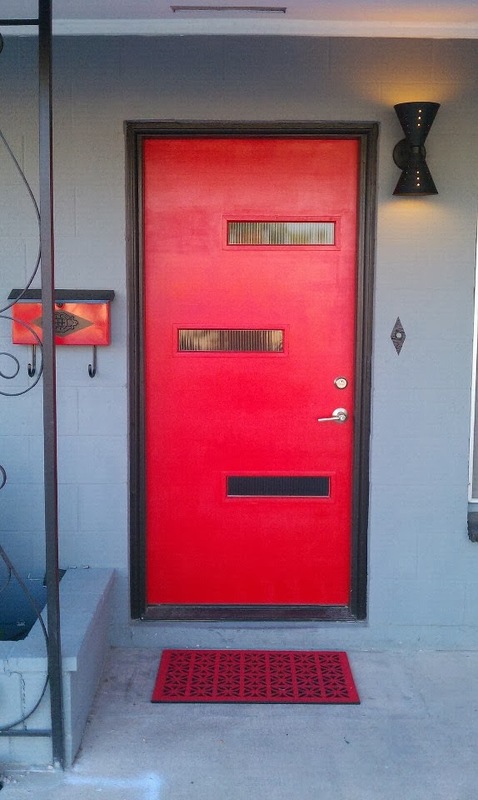 My front door is in dire need of love and attention; this article really helps with ideas. You mention carpenters who can add details to doors - is there anyone or a company you can recommend in particular? I came across this tour of Frank Sinatra's mid-modern home in Palm Springs, with links to other "modernism" architectural stories/video tours/features -- I hope you all like it --it also seems like you can subscribe to the feature in some manner, maybe even link from this site to theirs - ENJOY!